My Paper Crafting.com: Day 6: Irish Eyes Are Smiling! Day 6: Irish Eyes Are Smiling! Good morning crafty friends and welcome to Day 6 of our Christmas Crafting Fun Showcase. We hope you have enjoyed the projects, inspiration and freebies so far! Today we're stepping away from Christmas and looking a couple of months into the future! Our theme today is . . .
Celeste created this adorable little treasure using the Cricut Paper Doll Dress Up cartridge and today's FREE digi stamp file from PaperCraftingWorld.com. Paper Doll Dress Up and "Just Because" Cards. 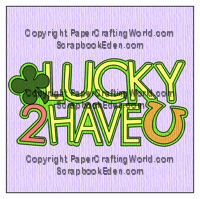 She also created this cute card using today's FREE digi stamp. adds such a nice touch to her card. Melin made this treat box with folded Paper Roses. Here is an inside shot of the box. 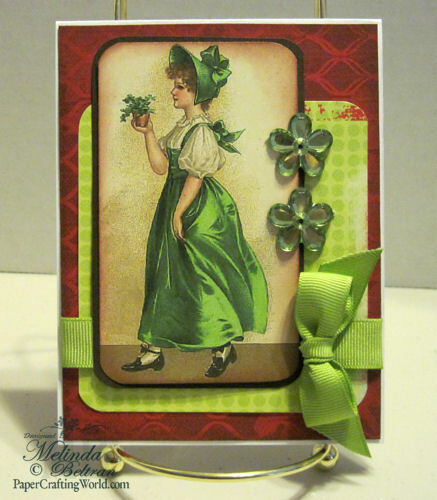 Melin created this card using one of the free vintage graphics downloads for today. I used Quick Quotes Savvy Davvy Designer Paper, Some Rhinestone flowers from Kaiser Kraft and some Basic Ribbon. Leave a comment on at least one post during December 1st through December 8th (For this week’s prizes). Winners will be randomly selected from comments, checked for blog-following compliance and announced on Saturday, December 10th. The Twinery - Ultimate Sampler Pack Giveaway PLUS 10% off your purchase December 1-15. 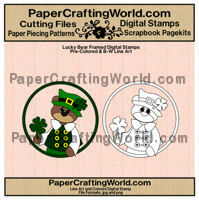 USE Coupon CODE: CRICUT10. Cutters Creek - *$25 Gift Certificate PLUS $10 off your purchases of $75 or more. This includes a great sake of 15-50% off most of the store AND free shipping! Use Coupon Code:HOLIDAY2011. Available in Pre-Colored and Black & White Jpg format. This link contains the zipped folder with files. Available in AI, DXF, EPS, GSD, KNK, MTC, SCAL2, SVG and WPC. 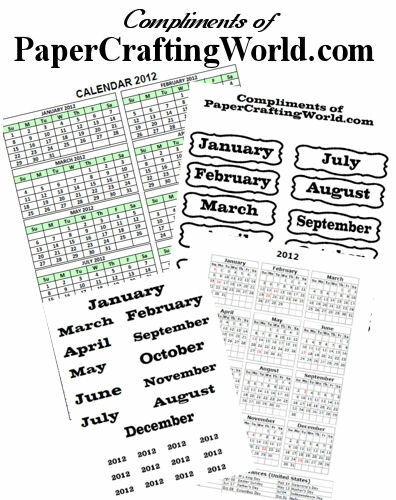 For those of you just starting to follow us, we are steadily throughout the 25 days showcasing super cute 6x6 calendar pages that you can re-create for yourselves or as a gift. 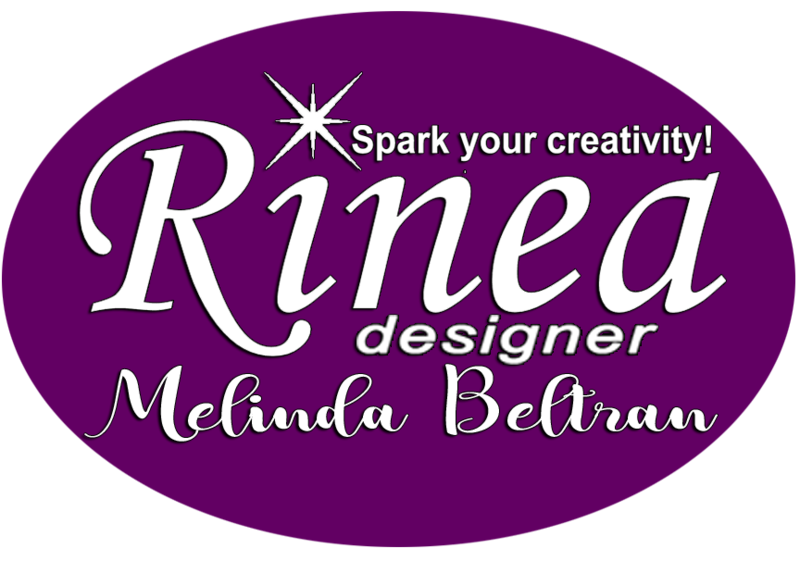 Here is the FREE download we are offering that the designers have used. 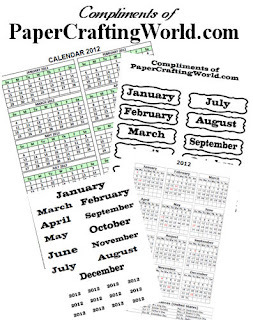 The folder contains two versions of small ready to print monthly calendars and the Month labels in two versions as well. Wow! Love all the inspiration. The projects are awesome. Thanks for all the freebies too! Such beautiful projects....wish Christmas was 3 months away so I'd have time to make them all! Thank you again for these inspiring projects! Oh WOW!! I am amazed witg all of these beautiful projects. 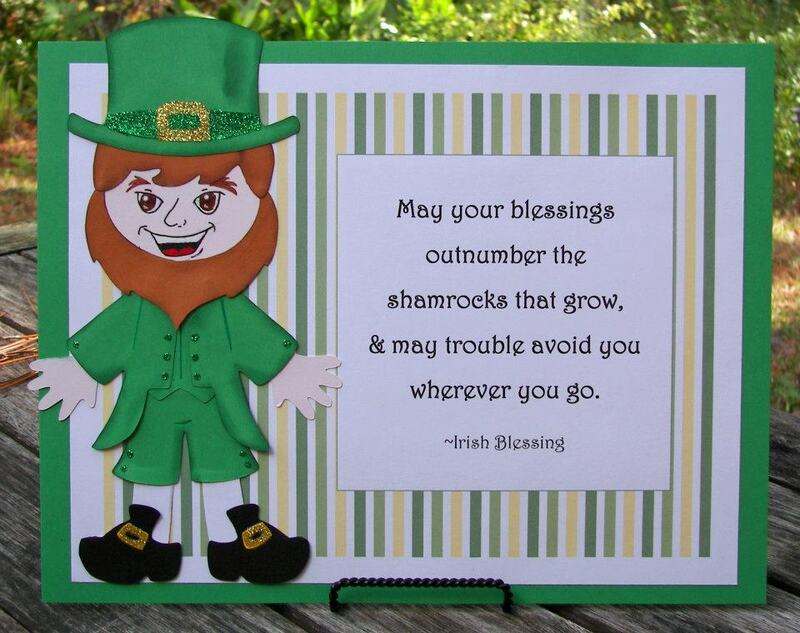 The kuck of the Irish will surely be with you! Adorable projects and files. Thank you so much. 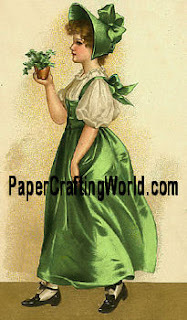 Love all the wonderful vintage images you have been sharing with us and cant wait to create something with them!!! I also am glad for the folded rose technique I have been trying to do this and maybe now I have it figured out!! Thanks for all your help!! Very cute projects! I love the calendar page!! I'm doing calendars for Xmas presents and i hit a creative block! This just gave me some great ideas so I can finish. It just might happen by Xmas!!! 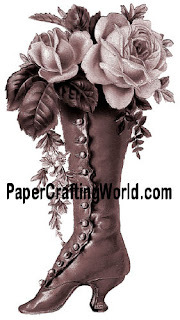 Lovely projects.. thank you for the paper roses tutorial.. I have tried them before with no success, but will try them again using your technique.. thanks for the chance to win some great prizes..
Great projects. Love the calendar. Thank you again for the lovely downloads. looking foward to march. I dont do winter well. Great projects DT!! Wow..I love all the green. Such a fun color. Thanks for the calendar DL!! 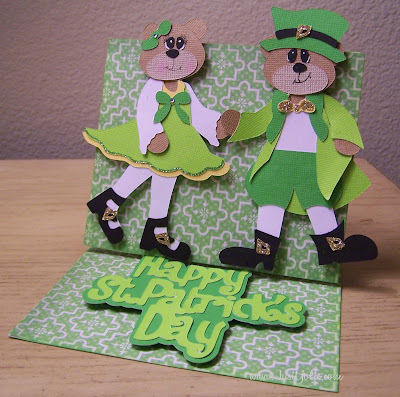 Wonderful St. Patrick's Day creations. 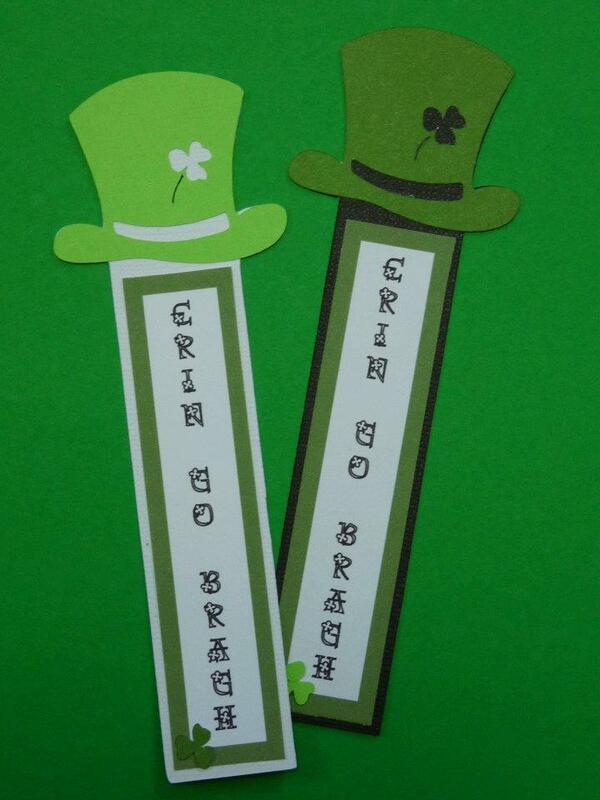 May the Luck of the Irish BEE with you. Was wondering if it would not Bee to difficult that when one hits the continue shopping that instead of ending up at the top of blog post that it take one back to where they came from within the blog post so one did not have to then move down again and continue to get the rest of the freebies. So many beautiful projects! I'm green with envy of your talent. 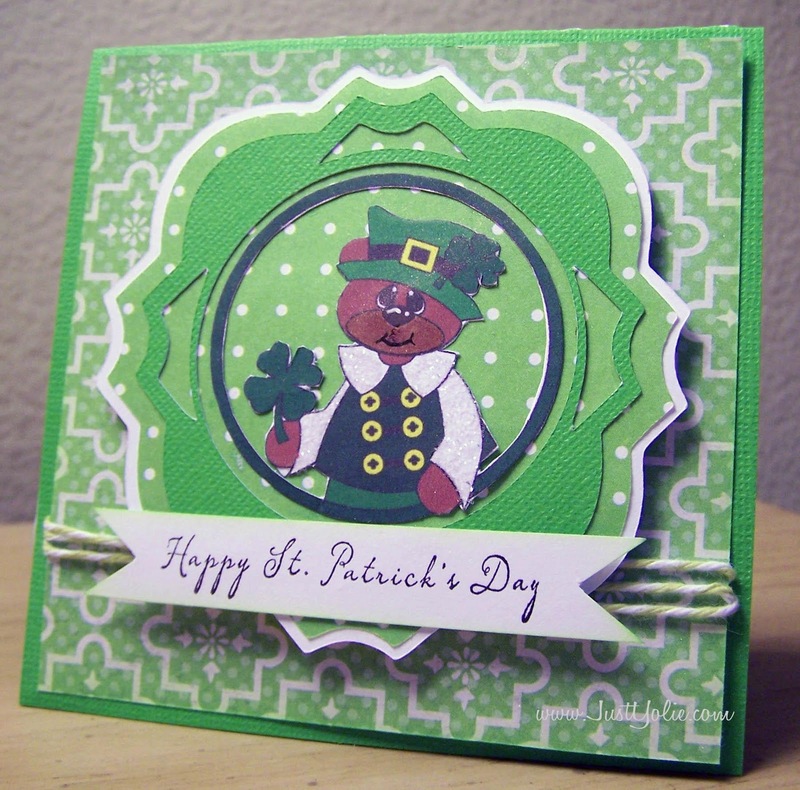 Great cards, Great printables! 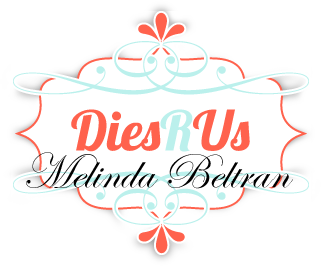 Melinda, great job for your 1st video. Thanks to all for sharing these talents and gifts with us. Thank you once again for the lovely freebies! What a beautiful card - the colors look great together, and the bow is fabulous! You should do a tutorial on how to make bows next!! 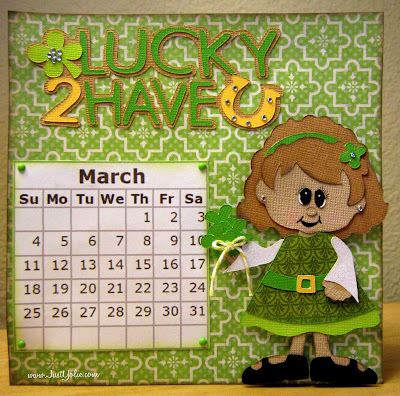 And we are Lucky today!!!!! Nice projects and great video. I never would have guessed it was your 1st video. I'm excited to go and try to make some flowers now. Thanks for the inspiration & this wonderful give away! Thanks so much! Love all the projects! Refreshing to see March in December! 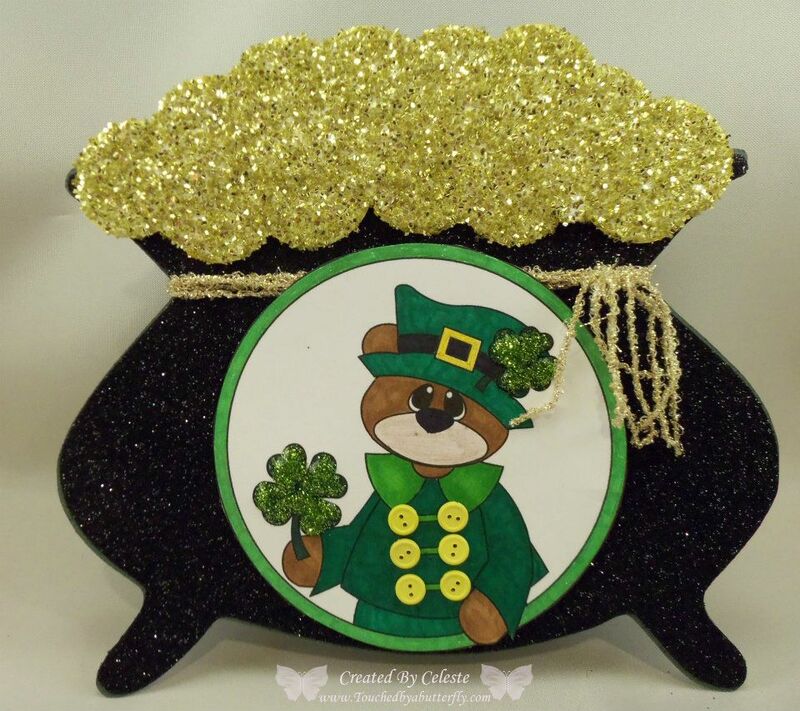 I love the Pot Of Gold and the box with candy. Thanks for sharing your ideas. Such pretty green projects! 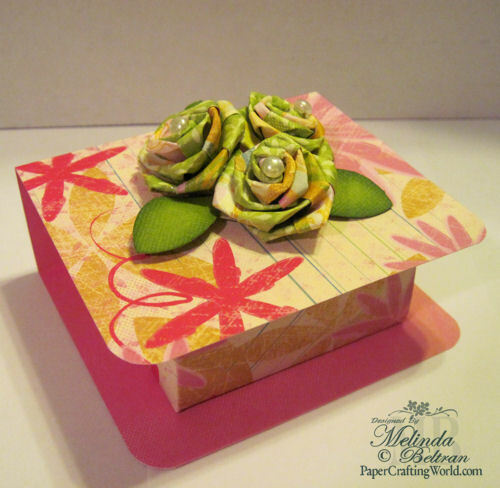 Love the treat box with the folded paper flowers! 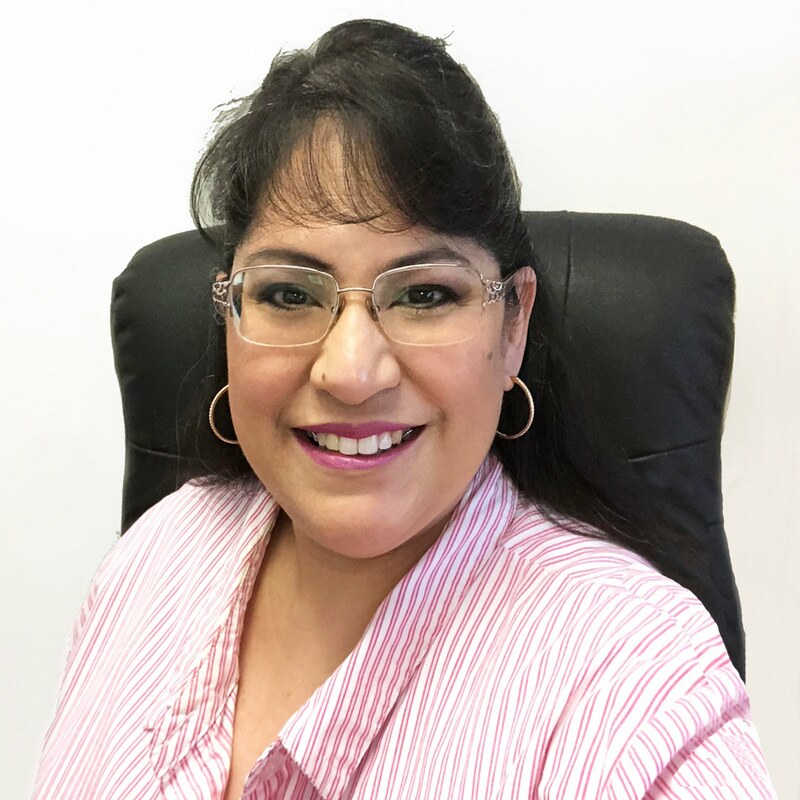 Thanks for sharing the great video--great to hear your voice! I must try the flowers! Oh, I am loving the vintage freebies and your pretty stamps! 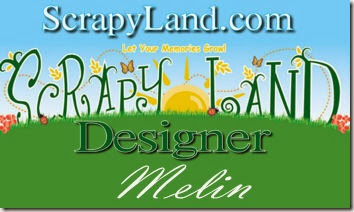 Melin, thanks again for your kindness! 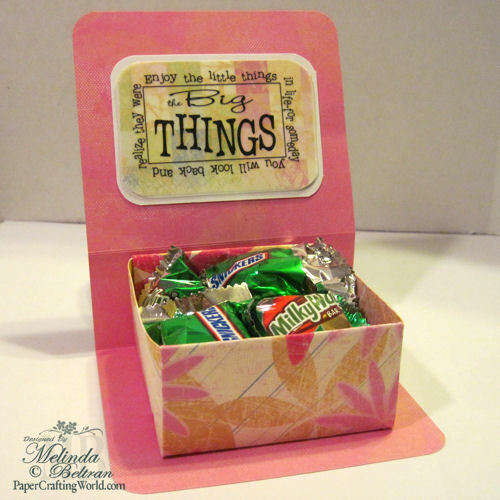 Wonderful projects..... found your blog through jenny's blog. Happy to have found it and look forward to seeing more creations! Thanks for all the freebies for today. They are really wonderful!! Love the chance to win the prizes, too! Thank you and your DT for bringing such wonderful "green" inspiration today. Love all the projects and today's freebies! Thank you again to the sponsors for giving such wonderful prizes to be awarded!! Wow, more great projects! I love that these are not just Christmas projects--gives me future inspiration. Thank you for the freebies also. 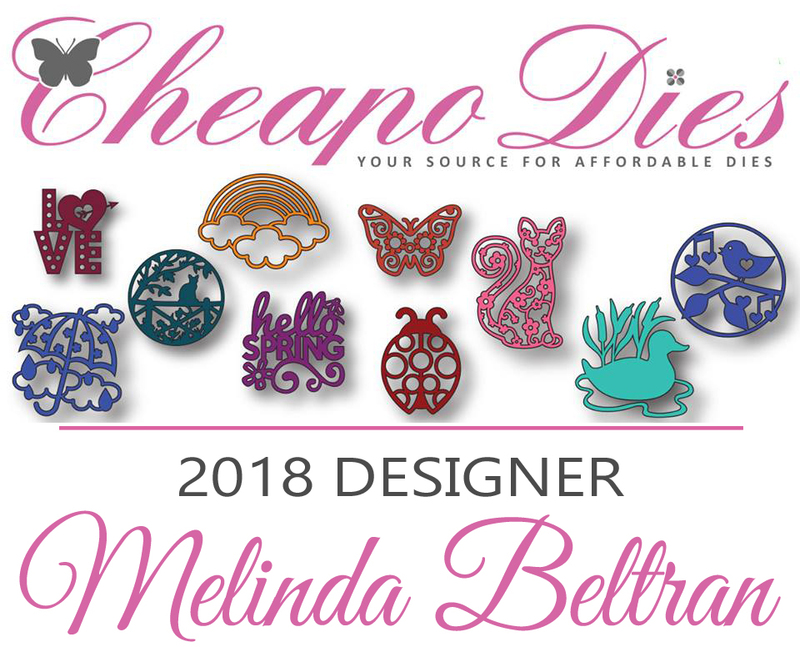 Thank you for every single idea and wonderful designs!I can not believe how simple and cute they are1They are like an eye candies-such pleasure to browse through all of them! thanks for the chance at the great giveaways. 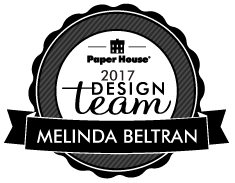 Melin and Design Team Members, love love love your projects. The talent you have and your willingness to share with Us. Thank You. Also, thank you for the freebies. Thanks for this wonderful opportunity to perhaps win on of the outstanding gifts. Great projects and love the freebies -- thanks!! Love these projects. 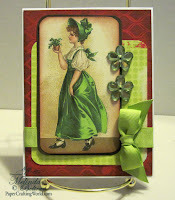 This Irish girl thanks you for all the green inspiration. Projects are wonderful and the free downloads are great. What a great list of sponsors! Thanks for all the files and inspiration. I have been following you for a long time.. since your "bun in the oven" .. remember that? (use different email to get blog posts) anyway, have not been let down since then! Great inspiration! The calendar page would also make a cute scrap book page! Thanks for sharing your video too! 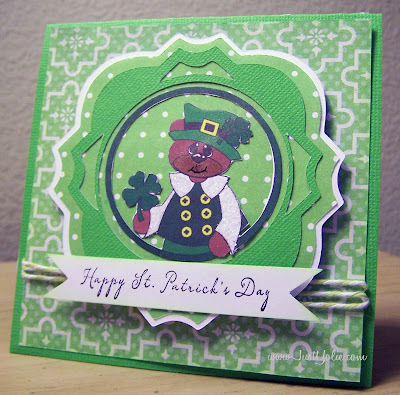 I love Irish themed crafts! This was fun to see what you all came up with! Love you all Irish Themed! I tried to pick up some of the freebies but they are charging for them. :-( I must be late. TFS! Great Projects. Thanks for the freebies! I'm bummed, though. I missed out on the freebies, too!